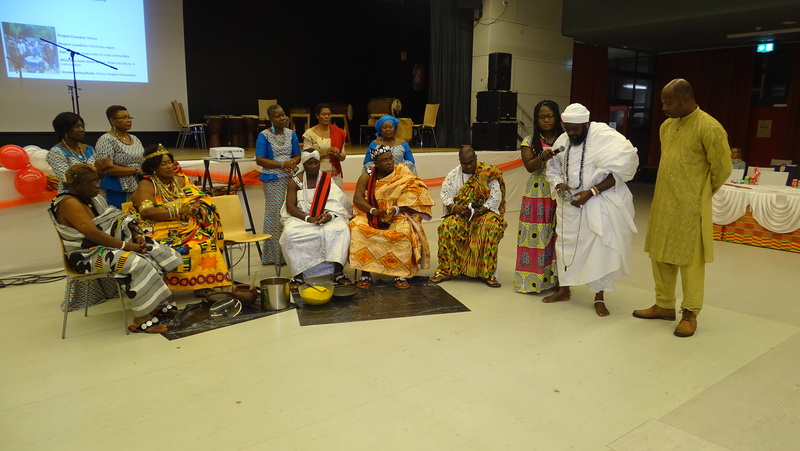 On the 13th October 2018, three unions of the GaDangme tribe named Osu Kpee, KAPSONG Culture association and GaDangme Community in cooperation with GaDangme Europe came together to celebrate the Homowo, Asafotufiam and Nmayem festival in Hamburg at Kulturhof Dulsberg, Alter Teichweg, 22049 Hamburg. 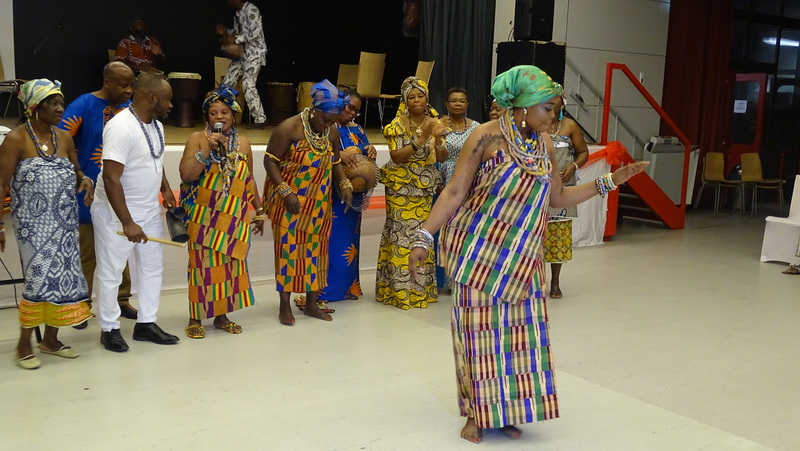 The Homowo festival is a festival popularly known and celebrated by the Ga´s. The Asafotufiam and Nmayem festivals are celebrated by the Dangme´s. The main brain behind the combination of these festivals is to show various ways the GaDangme ethnic group celebrate their festivals. On this Saturday, cultural acts such as the Dipo and the Klama dance were performed by the Dangme´s (KAPSONG). 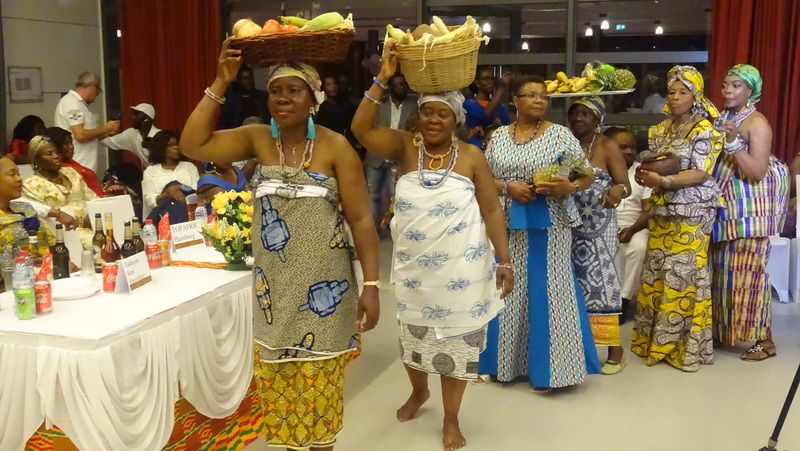 The Ga´s (GaDangme Community and Osu Kpee) also displayed the return of the Thursday arrivals also called Soo bii in the Ga language as well as Kpáa shimó. Kpáa shimó is a cultural act where the Ga´s dance and merry to a cultural music. The festival was graced by Nuumo Gbelenfo III, the Osu Gua wulomo who performed the traditional rite which includes pouring of libation. The pouring of libation is undergone during the Homowo festival celebration as well as the Ko gbamo traditional rite. Ko gbamo depicts the hooting and jeering at hunger and also appreciation to our forefathers and God for giving us enough food after many years of famine. 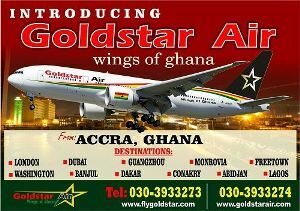 The Kpoikpoi was sprinkled by the Osu Alata Woleiatse, Nii Djamlodja VI. Further Chiefs and Queen named Seinye Maa Marmakai Bortorbli I, Nii Kofi Agboba V – Osu Alata Nefahene, Nii Bortey – Klagon Mantse were present. H.E. 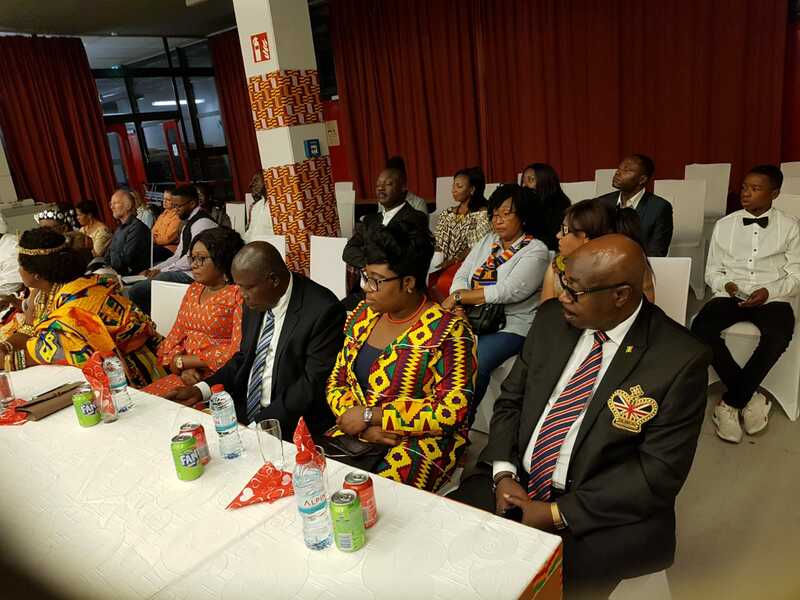 Madam Gina Ama Blay, the Ghanaian Ambassador for the Federal Republic of Germany graced the occasion with her staff. In the history of the GaDangme´s, it is believed that the folks have hooted and jeered at hunger and also swept away bad omens. During the day of the Homowo, Asafotufiam and Nmayem festival, all conflicts between families and friends are been cleared up in order for everyone to leave in peace and harmony. GaDangme´s therefore believe to enter the New Year with good luck. On this day KAPSONG culture association (KAPSONG means K for Krobo, A for Ada, P for Prampram, S for Se, O for Osudoku, N for Ningo and G for Ga) also made a presentation regarding a project the association is carrying out with the Kloma Hengme Initiative to support their people in the rural areas in the Krobo region (Manya Krobo, Lower Manya Krobo, Upper Manya Krobo and other districts). In these districts the inhabitants lack clean water which leads to diverse diseases. Children have to walk up to 266 minutes a day to fetch water. KAPSONG hereby appeals for funds in order to move the project forward. The day ended with the swearing in of the new elected Executives of GaDangme Europe by Nuumo Gbelenfo III with introduction to the people at the festival. As said earlier on, the combination of the three festivals has been the first to be celebrated in the whole of Germany. Hopefully, this won´t be a onetime history, but rather a festival celebration that will carry on annually, educating each other and getting to know our GaDangme culture and families better.